Islamic Civilization in Britain, at 1,200 years ago? King Offa of Mercia (ca. 730-796 CE) was one of the greatest pre-Norman kings in English history. Seizing the throne after a period of civil war, treachery and perilously short reigns, Offa consolidated control over the traditional domains of Mercia, centred on the Midlands and Welsh Marches. Over his long reign, Offa would go on to dominate the neighbouring kingdoms of Essex, Sussex, Wessex, Kent and East Anglia; essentially uniting all of England south of the Humber estuary. (1) That Offa had become a convert to Islam, and took this means of declaring his acceptance of that Faith by stamping the Kalima, or Islamic Confession of Faith, upon his coins. 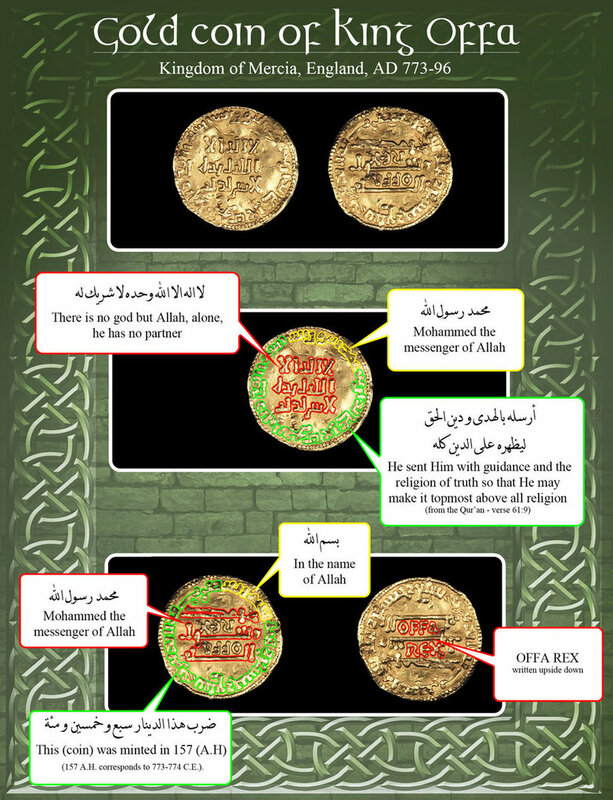 (2) That, without knowing the meaning of the Arabic words upon the coin, possibly merely regarding them as so much ornamentation, Offa had the coin struck off, merely adding, in order to identify himself with the same, the words ‘Offa Rex’ stamped also thereupon. 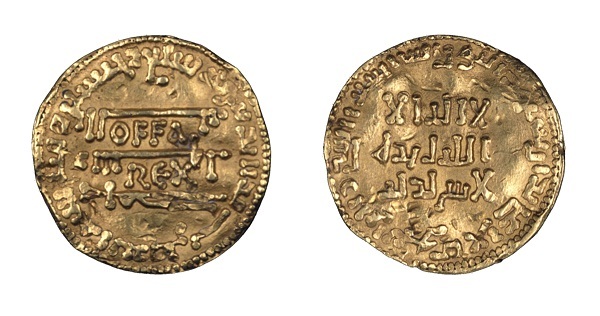 (3) That, as many pilgrims proceeded from England to the ‘Holy Land’ of Palestine, then under the dominion of the Muslims, this coin was struck, bearing this Arabic inscription in order that it might be the more readily accepted by the Muslims, and thus facilitate the journey of the pilgrims are assist them in trading (which may of them did) in those lands. (4) That the piece was not a coin intended for general circulation, but was struck specially as a mancus and as one of the quota of 365 gold pieces which Offa had vowed to pay annually to the Pope of Rome. Pos ini dipublikasikan di history, kanzunQALAM. Tandai permalink. and found most guys will approve with your site. Fascinating analysis! Thanks, especially, for sharing translations of the Arabic inscriptions. The histories of our countries are certainly much more closely entwined than people often imagine.